Andrew McIntosh is a British artist whose new body of work re-contextualises derelict buildings in south east London, drawing on his ongoing interest in the political dispute between artists and the inevitable developments of the property market. As a fan of Urban Decay and Derelict Art, one favourite artist being J Bennett Fitts, I was keen to explore what makes Andrew tick, his ideas, inspiration and his agreeable dislike for the harsh judgements society makes and the bad side of the media spawning marginally un-talented pools of clickbait. By Rosanna Head. I’m an oil painter who is better at destroying brush marks than adding them. Tell us about the exhibition and what you wanted to achieve? I was hoping that by returning to the starting point of my abandoned dollhouse project (2013) that I could open new doors and continue to work through this idea using derelict buildings in the surrounding areas of south east London. Then, by making improvements after the work has had time to properly digest. In this exhibition, the idea was to create an invitation to investigate what is going on architecturally, culturally and politically. The seemingly neglected facades depicted in the series gesture towards abandoned interiors, absent of life, that offer the viewer an imaginary cross-section of part of the building, inviting you to gaze voyeuristically into a room. In each of the rooms, there is an unusual device, that might be a sculpture in the shadow of the room beside a gloriously displayed masterpiece, prompting the viewer to look a little deeper beyond the surface. And on closer inspection, the darker function of these forms is revealed as a torture device. Mainly my distaste for the harsh judgements we make, i.e. the bad side of entertainment, technology and media, spawned to create modern gladiatorial arenas for the marginally talented in a society more and more frequently governed by clickbait, with the lack of time and necessity to look deeply; the intellectually profound and interesting could easily slip under the radar. As a protest, I feel the truth is now vital so (using surrealism) I try to paint it. With this work, we prompt the audience to peer deeper into the cultural values which lie beneath the surface of the city. What is your most memorable piece of work? “The Tower of Babel” by Pieter Bruegel. 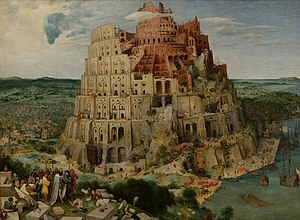 The Tower of Babel (Bruegel), Wikipedia. Anyone who puts their head above the parapet or offers truth. A few contemporary artists in the list include Jenny Saville, Hurvin Anderson, Jonathan Leaman. Is there a seminal moment in your life that has made a profound impact on your work? There are so many; every rejection, every failed painting. But here’s the earliest: I have strong memories of being a small child in primary school and devising a scale drawing system using a clear ruler. As the kids around me finished their clumsy drawings mine was just beginning. The cost for this process was time and the realisation that what I needed was much more of it. Why did you select south east London as a focus? I am attracted to the facades and the layers of veneers, the interesting way a building ages through the generations. Peckham has lots of this. To keep painting and improving my technique and execution. Where are your favourite selondon spots? I like the bar Two Hundred and the restaurant Forza Win. And just for fun, who would be your ideal fantasy dinner guests? Turner, Bruegel, Bosch, Goya and an amazing translator. Andrew McIntosh, ‘I Saw This Coming’ runs at bo.lee Gallery until 6th April 2019. 222 Rye Lane, London SE15 4NL.